In “Visual Phasing: An Example (Part 1),” we identified and labeled all of the recombination points in the three siblings, Susan, Brooke, and Felix. Then, in Part 2 of the series, we used the identified and labeled recombination points to assign segments of DNA to the four grandparents (the blue grandparent and grey grandparent pair, and the purple grandparent and green grandparent pair). In Part 3 of the series, we used cousin matching to identify the grandparental source of the chromosomal segments. 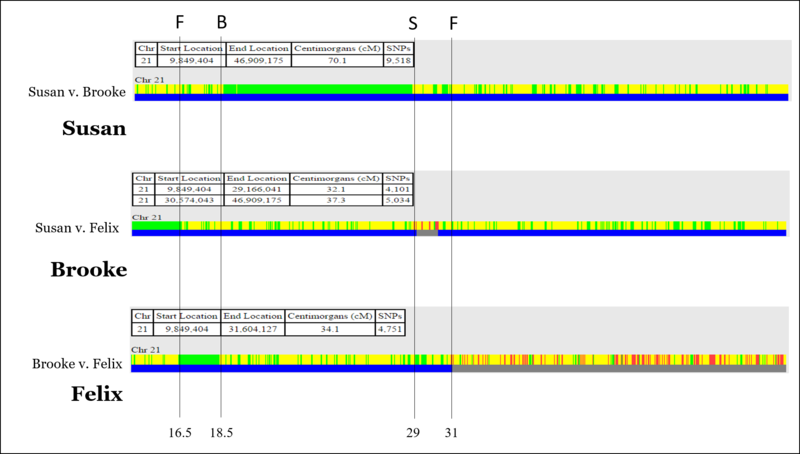 And finally, in Part 4 of the series, we characterized my paternal chromosome. Now that we have this information, let’s see if we can use that to explore new matches with Brooke, Susan, and Felix. ... Click to read more! Since Felix is my father and Susan and Brooke are my aunts, I might be able to compare my DNA to my aunts in order to identify which of the segments I obtained from my father. ... Click to read more! But without more information, we don’t know to which grandparent each segment belongs. Today, we’ll use cousin matching (defining “cousin” to mean anyone other than the siblings) to first identify the maternal pair of chromosomes, and the paternal pair of chromosomes. Hopefully, in the process, we’ll be able to assign the segments to each of the four grandparents, rather than just maternal/paternal. ... Click to read more! In Part 2 of the series, we’ll use the identified and labeled the recombination points to assign segments of DNA to the four grandparents. Each of the blue and purple segments is one of the following segments: (i) paternal grandfather; (ii) paternal grandmother; (iii) maternal grandfather; or (iv) maternal grandmother. We’ll try to figure out which is which later. ... Click to read more! 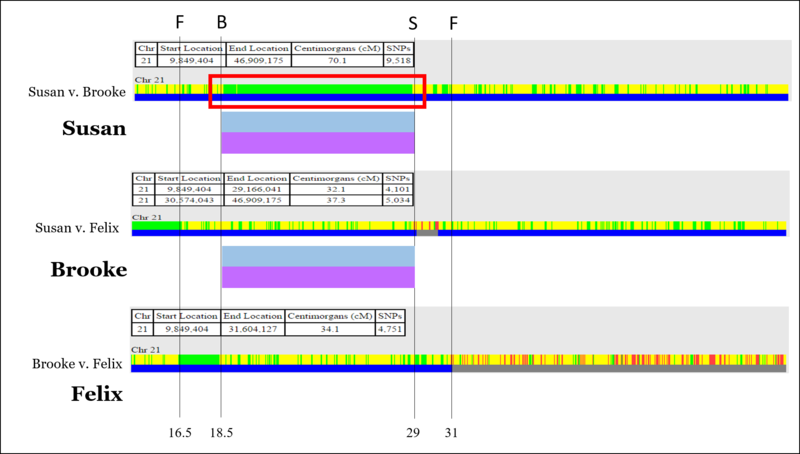 Visual Phasing is a process by which the DNA of three siblings is assigned to each of their four grandparents using identified recombination points, without requiring the testing of either the parents or grandparents. Although the process does not automatically reveal which segment belongs to which of the four grandparents, matching with cousins provides this identification as a further step of the process. ... Click to read more!